I am slowly, yet frantically, designing the house. It needs to be complete by the beginning of May for a big ol’ feature, and while that seems far away – in order to make sure that it’s actually well designed and not just a bunch of furniture living together, I need to make some serious decisions very quickly. Today we are talking about the bed in our bedroom. Most of what is already in the room came from the other house and is staying – the leather nightstands are perfect, I love those lamps, that rug is a dream (I secretly want the look of an antique tabriz in here, but that rug is just too amazing to step onto in the morning to give up) and the bedding is great, but might be switched out/added to. The wall color is Ammonite by Farrow and Ball and it’s just amazing – so warm, neutral and soft. We’ve got a great start and it’s a totally pleasant room to be in as-is. We have temporary $5 blackout curtains over our headboard windows (see below) for now, but the other ones are blank. I’m not sure why we have any curtains in there because those children wake us up before the sun is up anyway, but some day, SOME DAY we’ll be psyched that we have black out shades because they’ll be sleeping in til’ 8:30am (fingers crossed). We have three major things to add – window treatments (we ordered custom shades via Calico Corners out of a super pretty Swedish gray washed linen, lined in blackout), the dresser (we are having this one painted caldwell green) and today’s biggest quandary – THE BED. Now there are only three ways to orient the room/bed but this one makes the room feel the biggest and allows for the largest dresser (opposite the bed). You don’t wake up to the view, but we have a serious storage situation in this house so this is the best layout to maximize the storage without making the room feel crowded and tiny. Instead of that dresser we are getting this one that is 6′ long and not quite as deep but has way more storage. 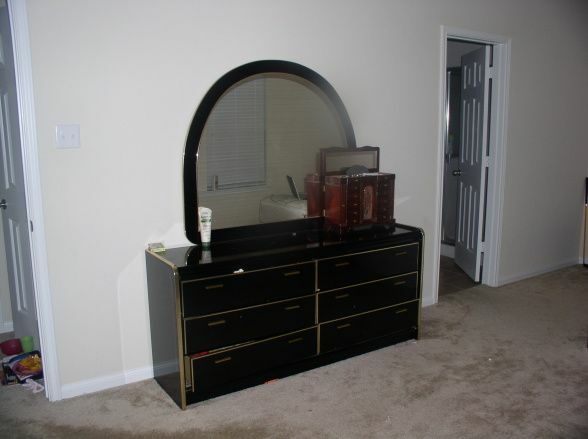 We’ll be selling that beautiful dresser when we get our new one, so email hello@emilyhendersondesign.com if you are interested in purchasing it. It will be $800, it’s antique English pine, in perfect condition and it’s very, very special – just not the right shape for the room. So the new dresser will span all the way across (yay!!) but be lower. I’ve been obsessed with this company for a few months now so I’m psyched to get this dresser (in a custom dark matte greeny-blue). Option A: a curved headboard in a patterned fabric. I fell in love with this fabric although I’m unsure that it will work on something curved because it is technically a stripe – albeit a shaky one. And i’m terrified because it might be like $200 a yard (I’m hoping wholesale is much cheaper). Why is it so hard to decorate for yourself? I come up with secret pinterest boards to decorate friend’s houses or (future) beach houses (crazy? yes, but what else are you going to do while breastfeeding every 2-3 hours), but my own requires hours of research and deliberations. Oh and I love love love the light that would still come through the headboard with option 6 (like many people said above). That’s a huge plus! The Tate bed from Crate and Barrel is low and slightly tufted – http://www.crateandbarrel.com/tate-upholstered-bed/f37558 – I use it in front of a window and it’s nicely low profile. Our bed is against a wall so fighting with the linear window / allowing light is not an issue for us, but when we designed our bedroom our children were younger than yours and we all already loved lots of family snuggling. They’re now 12 + 10 and we still are a family of cuddlers. I have never regretted our upholstered headboard — so comfy, so encouraging of sitting up in bed — plus some of our cats (well, one in particular) is bananas for walking along the top of it. Win win. So when *I*, as the cuddly mother with cuddly kiddos (+ cats), solid fabrics would bore me to death in a New York minute plus are less forgiving …, look at your room I lean toward the curved upholstered choice in your Schumacher textile with a stong welt Even retail i don’t think the fabric is that expensive as you won’t need heaps of it. I pick #6 plus a short flat cushion against the headboard, like an older Scandinavian style. Option 6, the rounded corners of the wood frame give you a similar break as the curved headboards but also plays well with the nightstands plus you can see more of the beautiful window. I love number 6 and number 2. The Windsor is great, but I don’t think I have ever seen a low oval headboard before…plus navy is my favorite color. Yep, this could actually be cool. Otherwise, I vote for moving the bed to the other end of the room. That is the nicest window you’re covering up, plus there’s nothing better than lying in bed and looking out the window 🙂 No it’s not the best layout, but your old room had the door by the side table. I’m not a fan of beds under windows. And these are all slightly dull, especially compared to your old bed! Option 6! It ties in the night stands and seems more cohesive. And the airiness in front of the window is a plus. To add confort (padding) and your favourite textile, why don’t you add a cushion like this (http://shoppe.amberinteriordesign.com/collections/frontpage/products/penny-bed), instead of a bolster in the front? After a little more thought (I have been thinking about this way too much considering this is not my home, ha … I love design and can’t help it!) … I think a low profile, simple, linen headboard like this one: http://www.serenaandlily.com/broderick-shelter-bed/mBRSB.html#start=12 (you have it linked above) … would look the best. Your eyes would be drawn to the beautiful window details and textures throughout the room vs. the headboard. I think I might be the only one not jumping on the #6 bandwagon, ha!